This article is about the film. For the musical, see Billy Elliot the Musical. For other uses, see Billy Elliot (disambiguation). The film stars Jamie Bell as 11-year-old Billy, an aspiring dancer dealing with the negative stereotype of the male ballet dancer, Gary Lewis as his coal miner father, Jamie Draven as Billy's bullying older brother, and Julie Walters as his ballet teacher. The film was theatrically released on 29 September 2000 by Universal Pictures and Focus Features. It received positive reviews from critics and it earned £72,853,509 on a £3 million budget. In 2001, author Melvin Burgess was commissioned to write the novelisation of the film based on Lee Hall's screenplay. The story was adapted for the West End stage as Billy Elliot the Musical in 2005; it opened in Australia in 2007 and on Broadway in 2008. In 1984, Billy Elliot, an 11-year-old from the fictional Everington in County Durham, England, loves to dance and has hopes of becoming a professional ballet dancer. Billy lives with his widowed father, Jackie, and older brother, Tony, both coal miners out on strike (the latter being the union bully), and also his maternal grandmother, who has Alzheimer's disease and once aspired to be a professional dancer. Billy's father sends him to the gym to learn boxing, but Billy dislikes the sport. He happens upon a ballet class that is using the gym while their usual basement studio is temporarily being used as a soup kitchen for the striking miners. Unknown to Jackie, Billy joins the ballet class. When Jackie discovers this, he forbids Billy to take any more ballet. But, passionate about dancing, Billy secretly continues lessons with the help of his dance teacher, Sandra Wilkinson. Mrs. Wilkinson believes that Billy is talented enough to study at the Royal Ballet School in London, but due to Tony's arrest during a skirmish between police and striking miners, Billy misses the audition. Mrs. Wilkinson tells Jackie about the missed opportunity, but fearing that Billy will be considered to be gay, both Jackie and Tony are outraged at the prospect of him becoming a professional ballet dancer. Over Christmas, Billy learns his best friend Michael is gay. Although Billy is not, he is supportive of his friend. Later, Jackie catches Billy dancing in the gym and realises his son is truly gifted; he resolves to do whatever it takes to help Billy attain his dream. Mrs. Wilkinson tries to persuade Jackie to let her pay for the audition, but he replies that Billy is his son and he does not need charity. Jackie attempts to cross the picket line to pay for the trip to London, but Tony stops him. Instead, his fellow miners and the neighbourhood raise some money and Jackie pawns Billy's mother's jewelry to cover the cost, and Jackie takes him to London to audition. Although very nervous, Billy performs well, but he punches another boy in frustration at the audition, fearing that he has ruined his chances of attaining his dream. He is sternly rebuked by the review board, but when asked what it feels like when he is dancing, he describes it as being "like electricity". Seemingly rejected, Billy returns home with his father. Sometime later, the Royal Ballet School sends him a letter telling him he has been accepted, coinciding with the end of the miners' strike, and he leaves home to attend. In 1998, 25-year-old Billy takes the stage to perform the Swan in Matthew Bourne's Swan Lake, as Jackie, Tony, and Michael watch from the audience; his father is visibly moved by the performance. Jamie Bell (pictured here in 2015) played the title character for his debut role in the film. Lee Hall developed Billy Elliot from his play Dancer, which premiered as a rehearsed reading in 1998 at the Live Theatre in Newcastle upon Tyne. He was heavily influenced by photographer Sirkka-Liisa Konttinen's book Step by Step, about a dancing school in nearby North Shields. Writing in 2009, Hall said that "almost every frame of Billy Elliot was influenced by Step by Step ... as every member of the design team carried around their own copy." Just short of the patch of grass where Andrew and Alnwick Streets once stood. The street in view is Avon Street. Due to Easington Colliery's pit closure in 1993, the mining scenes were filmed at the Ellington and Lynemouth Colliery in Northumberland, with some filming in Dawdon, Middlesbrough and Newcastle upon Tyne. Scenes inside the Elliot home and local street shots were filmed in Easington Colliery, with the producers using over 400 locals as extras. Alnwick Street, on which the Elliot family lived at number 5, was one of several streets demolished in 2003 after becoming derelict. Michael lived at the corresponding number across the alley to the west on the also-demolished Andrew Street. A green space now stands in their place. Avon Street, to the east, which is still intact, is shown when the postman walks up to the front of the Elliot residence to deliver Billy's letter from the Royal Ballet. The faded white-brick wall of Wright's Prize Bingo, on Ashton Street, is also still visible. This was directly in line with the Elliots' terrace. Almost all of the scenes set in Everington were filmed at the top of the sizable slope that is visible in the street views, near the allotments on Tower Street that still remain today. Easington coal mine was located past the eastern end of Tower Street. It is also down Tower Street that Billy is seen dancing with his ballet shoes around his neck. He then turns right to go behind the Anthony Street terraces, looking down the hill to Ashton Street, on what is now Gardener and Leech Courts, with Bede Street rising up on the other side. The rear of Anthony Street, where Austin and Arthur Streets once stood, is also used in the scene in which Billy steals a ballet book from the mobile library van. After a dance class, Mrs Wilkinson drops Billy off at a vacant lot of land on Crawlaw Avenue, just beyond Andrew Street. There are three scenes filmed at the southern end of the terraces: when Debbie is dragging the stick along the walls (and police shields) on Ashton Street at the ends of Avon Street, firstly, and then Alnwick Street. Billy then crosses Ashton Street en route to Seaside Lane. The same crossing is made by Billy, Jackie and Tony when they take Billy to the bus station. Mrs Wilkinson parks on Ashton Street, at the bottom of Alnwick Street, when she pays the Elliots a visit. The Rialto, a former cinema on Oswald Terrace, is shown briefly in the movie. It is now the only surviving cinema building in the town, although it has now been taken over by a carpet superstore. Part of the original façade, which Billy walks by, is still visible, however. It ceased being a cinema in the mid-1970s. It is in the alley behind Oswald Terrace that the Christmas scene featuring Billy and Michael is shot. Fake snow is used to cover the scene. The rear of the Rialto doubles as that of Everington Boys' Club, where Billy attends boxing and dance practices. The interior shots were filmed on the top floor of Hanwell Community Centre in London. The viaduct shown during Billy's angry scene is the Green Drive Railway Viaduct in Seaham. It is viewed from Queen Alexandra Road. The Miners' Welfare Hall is in nearby Dawdon, as is Embleton Street, up which Billy does his "angry dance". While made to seem like it is the same street, the corrugated iron wall at which he comes to a stop is at the end of the alley between Embleton Street and Stavordale Street West. The structure was a temporary installment to hide Shrewsbury Street behind it. Fake snow is used once more. The cemetery in which Jenny Elliot is buried is in Lynemouth. Billy and Michael's cross country run takes place in Ellington. It is the River Lyne that is passing through to the next village, Lynemouth. The bridge sequence was filmed on the Tees Transporter Bridge across the River Tees. New Wardour Castle, near Tisbury, Wiltshire, doubled as London's Royal Ballet School. The bus station, from where Billy leaves his father and brother for London, is the now-demolished Gallowgate Bus Station in Newcastle. The performance of Swan Lake takes place at the Theatre Royal in Haymarket, London. On 22 May 1999, it was announced that Jamie Bell would play the lead role in the film, while Adam Cooper and Julie Walters were in early talks to join the cast. On 3 June 1999 it was reported that Gary Lewis, Jamie Draven, Jean Heywood, Stuart Wells, Merryn Owen, Nicola Blackwell, Colin Maclachlan, Mike Elliott, Billy Fane, Janine Birkett, Charlie Hardwick, Matthew James Thomas and Stephen Mangan were also in final talks to join the film, and Patrick Malahide and Barbara Leigh-Hunt were added to the cast, playing the Royal Ballet School principals. On 17 June 1999, Neil North and Lee Williams joined the cast of the film, playing the Royal Ballet School tutors. 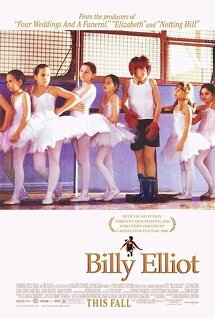 Billy Elliot was originally released at the 2000 Cannes Film Festival under the title Dancer. It was later decided to re-title the film Billy Elliot to avoid confusion with Dancer In The Dark, another film at Cannes that year. Billy Elliot was theatrically released on 29 September 2000 by Universal Pictures and Focus Features. Universal Studios Home Entertainment released Billy Elliot on DVD and VHS on 25 October 2001 and on Blu-ray Disc on 10 January 2012. The film holds an 85% approval rating on Rotten Tomatoes, based on 116 reviews with an average rating of 7.3/10. The website's critical consensus states: "Billy Elliot is a charming movie that can evoke both laughter and tears." On Metacritic, the film has a weighted average score of 74 out of 100, based on 34 critics, indicating "generally favorable reviews". Roger Ebert gave the film three out of four stars, complimenting the performances of Julie Walters, Gary Lewis and Jamie Bell in particular. Stephen Warbeck scored the music for the film. The soundtrack was released on 11 March 2002, and includes several well-known glam rock and punk songs from the likes of T. Rex and the Clash. The soundtrack also contains pieces of dialogue from the film. In 2004, English singer/songwriter Elton John joined forces with the film's screenwriter Lee Hall to produce a musical adaptation of the film, which premiered 31 March 2005 at the Victoria Palace Theatre on the West End. Many of the film's crew took part in the stage production, including director Stephen Daldry and choreographer Peter Darling. The musical received positive notices and ran for over 4,000 performances before closing in April 2016. ^ "BILLY ELLIOT (15)". British Board of Film Classification. 21 August 2000. Retrieved 7 November 2014. ^ a b "Billy Elliot (2000)". Rotten Tomatoes. Fandango Media. Retrieved 9 April 2018. ^ The Journal (17 June 2014). "Lee Hall interview: Why Lee will always love Live Theatre". The Journal. Retrieved 6 January 2015. ^ Konttinen, Sirkka-Liisa (2009). Byker Revisited. Northumbria Press. p. vi. ISBN 1904794424. ^ "Easington Colliery". Durham Mining Museum. Retrieved 9 April 2018. ^ a b c "Feature: Billy Elliot". BBC Tyne. BBC. 17 October 2006. Retrieved 6 January 2015. ^ "Billy Elliott's house to be bulldozed". BBC News. BBC. 1 November 2002. Retrieved 9 April 2018. ^ "Village shares its Billy Elliot stories at live screening of West End show". The Guardian. Guardian News and Media. 28 September 2014. Retrieved 9 April 2018. ^ "Dying for someone to take care of cemetery; PLEA FOR LANDOWNERS TO CLEAN UP OVERGROWN GRAVEYARD". Evening Chronicle. Trinity Mirror. 22 July 2008. Retrieved 9 April 2018. ^ "Billy Elliot Reviews". Metacritic. CBS Interactive. Retrieved 9 April 2018. ^ Ebert, Roger (13 October 2000). "Billy Elliot". RogerEbert.com. Ebert Digital LLC. Retrieved 9 April 2018. ^ a b "22nd Annual Young Artist Awards". Twenty-Second Annual Young Artist Awards. Young Artist Foundation. Archived from the original on 3 April 2011. Retrieved 31 March 2011. ^ "Billy Elliot Soundtrack". Amazon. Retrieved 30 December 2009. ^ Brown, Peter (11 May 2005). "Billy Elliot - Victoria Palace Theatre 2005". London Theatre Guide. Retrieved 18 December 2016. ^ "Billy Elliot musical dances out of West End". BBC News. BBC. 11 December 2015. Retrieved 9 April 2018. Jacqueline Jones, "Small Towns and Big Dreams: Meditations on Two Mining-Town Movies" Perspectives on History (Feb 2011) 49#2 pp 30–31, compares film with "How Green Was My Valley".